YouTube is a fantastic resource for schools to teach content and for students to learn content. For pretty much any topic you can think of, someone has made a video explaining it (which I greatly appreciate when I have had to replace parts in my clothes dryer three times in the last few years). The same thing is true for social studies. YouTube hosts thousands of educational videos on history, politics, geography, and more. Some are created by talented teachers sharing their classroom creations with the world, while others are made by companies, museums, and more. 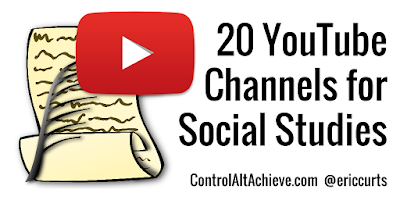 Recently I had the chance to curate a list of YouTube channels for a social studies inservice I was leading. 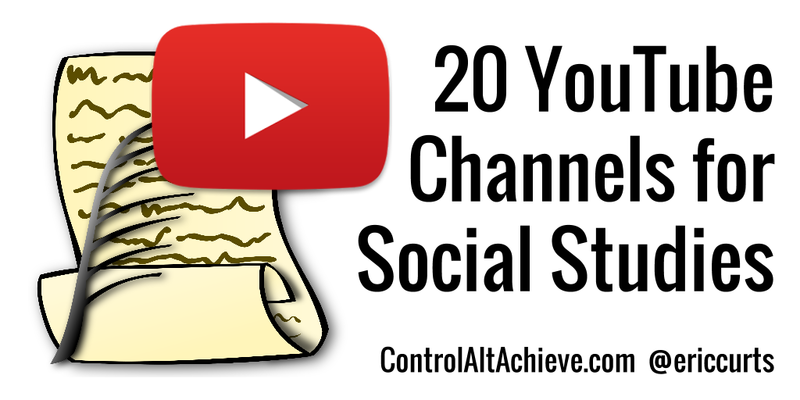 Below are 20 of the channels I found that are worth checking out for your classroom if you teach social studies. I am sure there are many more channels beyond what I have listed, so I would love to hear about others. Please use the comments section at the bottom to share links to your favorite YouTube channel or playlist for social studies. Educator Keith Hughes covers US History, politics, World History, and more. Mr. Beat is a teacher who creates videos about history, with many of them incorporating music and song. Although no longer making new videos, this channel has a wonderful collection of music video parodies that teach history (and are actually good). Educator Tom Richey provides history lectures for AP US History and AP European History. Cliff Langston and Jeremy Payne provide educational videos on topics including This Day In History, History Rewrite (Alternate History), History Deja Vu, and "top lists" to rank events from history. This channel investigates the 'What If?" of history, using knowledge of geography, population and other historical facts to see what could have happened if events changed. Videos on a wide range of topics including World History, US History, US Government, Politics, and Economics, as well as topics outside of social studies. TED-Ed creates excellent animated videos on a wide range of topics, including many that align with social studies. Khan Academy produces instructional videos on a wide range of subjects, including many that address social studies topics. Although the channel focuses on gaming, they have a massive playlist of animated videos for teaching a wide variety of history topics. Thousands of video biographies on famous people. This channel aims to provide a video profile for every single country in the world. Educational videos detailing the history of the First World War in the four years from 1914 to 1918. Daily breaking news and current events in politics, entertainment, sports, and more. Videos on politics, society, life, and news. Primary source historical videos from the US National Archives. A video collection of presidential speeches and addresses. Videos produced by the United States Holocaust Memorial Museum. Video resources on historical and current international issues from the Choices for the 21st Century Education Program at Brown University. Q and A videos on a wide variety of topics, with many related to social studies, politics, and history. Please use the comments section at the bottom to share links to your favorite YouTube channel or playlist for social studies. MrBettsClass is great for musical parodies related to SS also. Thank you for this list! I'd like to share a useful service for students who need some academic assistance. https://homeworkhelper.net/ offers ideal homework writing solution for all the academic levels.